Founded in Mbombela in 1996, Galito’s unique flame-grilled flavour and unwavering focus on product quality and affordability has fuelled its success throughout South Africa and the world. Along with our flame-grilled chicken, we welcome guests with true hospitality, warmth and a promise of great memories made over great meals. Where in the World is Galito’s? 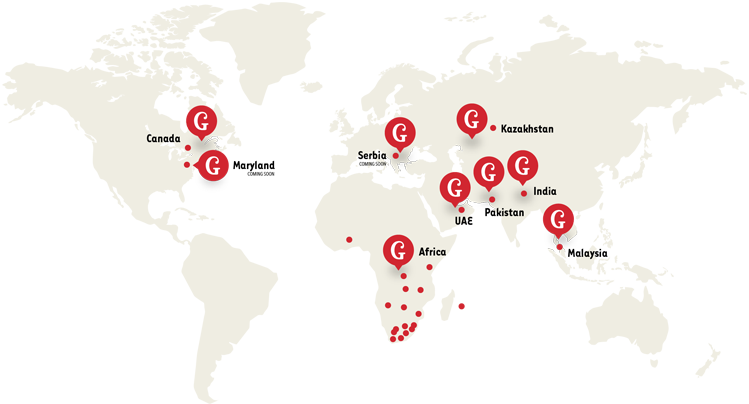 Galito’s now operates in over 16 countries, with more than 150 stores and counting - across Africa into Malaysia, Pakistan, the UAE, India and Canada. © Copyright Galito’s Holdings 2019. All Rights Reserved.